The XPOWER X-800TF Cage Dryer with 800MDK Multi Cage Drying Hose Kit is perfect for busy grooming shops that book many coated breeds requiring high air volume and hands free drying. Featuring a low maintenance motor, this dryer is durable, lightweight, quiet, and powerful - producing 3200 cfm HEAT FREE airflow. The X-800TF is packed with convenient features such as 3 adjustable speeds, an optional TIMER (up to 3 hours), safe room temperature air, and an easy to clean SNAP OFF DOUBLE FILTER SYSTEM which captures hair debris allowing the dryer to operate at maximum performance. Run several of these dryers all day without worry of electrical costs thanks to an energy efficient 7.5 amp max draw. All XPOWER pet dryers are manufactured with durable, rugged and a high impact ABS styrene (the same that football helmets use) housing and affords the lowest possible maintenance to the user. 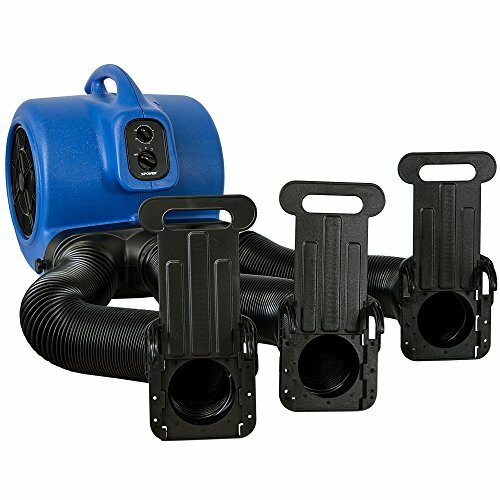 The XPOWER MDK Multi-Cage Drying Hose Kit for the Cage Dryer features a screw on secure styrene adapter collar with three durable 8 ft. x 4.5 inch flex hoses for multiple cage drying. Included in your kit are three air flow guillotine style gates with integrated cage attachment clips. AIRFLOW GATES CAN EASILY BE OPENED OR CLOSED to direct air flow into only occupied cages. Six secure metal hose clamps are included for flow gates and hose attachment. Hoses are made of highly flexible synthetic material with a metal inner support coil to facilitate hose expansion or collapse. The hose kit is preferred by groomers who desire reliable and versatile multi cage drying equipment. Thermal protection, ETL/CETL safety certified & 1 YEAR US MANUFACTURER'S WARRANTY. HOSES - Sturdy high-flex synthetic rubber construction with reinforced spiral metal support coil, 4.5 inch diameter no crimp and no pinch hose!